Today’s post was written by library student ambassador Darwin Chavez. Darwin is a senior Communications Studies major at LMU. Want to see more photos from the Haunting? Check out our Flickr gallery! The William H. Hannon Library was excited to host this year’s “Haunting of Hannon 666: Inferno.” The Haunting of Hannon remains a popular event, as evidenced by how quickly sign-up sheets for tours filled up before the event began. A large majority of those in attendance were other LMU students eager to see what the library had in store for them. Some were theater students who came to support their friends and classmates and wanted to watch them perform live. The event was written and directed by Kevin Wetmore, the chair of LMU’s Theater Arts program and cast with students from his department who put countless hours of work into making sure the night went off without a hitch. This year, the Haunting of Hannon drew inspiration from Inferno, the first part of Dante Alighieri’s Divine Comedy where the reader is taken on a journey through the nine circles of hell. 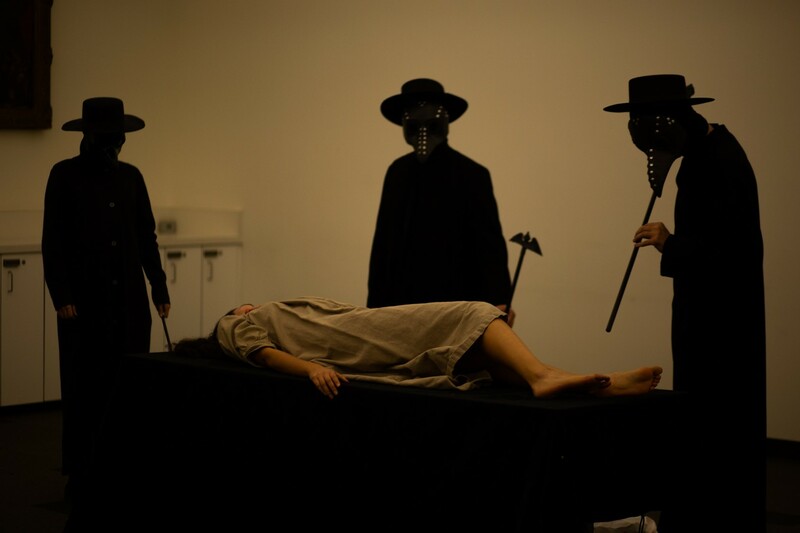 Just as Dante was guided through hell, visitors of the Haunting of Hannon were guided through the library’s basement then continued to ascend through the library as they witnessed eerie performances. Through incredible costumes, makeup, special effects, and acting, the theater program was able to bring their stories and characters to life. In lieu of a traditional stage, the actors used the library’s environment to deliver their performances, which allowed the audience to get a close look at everything that transpired in front of them. This unique setting allowed great interactions between the audience and performers as they were able to fully appreciate every word and aesthetic detail that went into this night. The cleverly crafted stories that were told came from a mixture of history and folklore that referenced well-known narratives such as The Strange Case of Dr. Jekyll and Mr. Hyde and real life horrors such as the Black Plague that struck Europe in the 14th century. They also succeeded in bringing back to life some of history’s notorious figures including Cleopatra and the Fox sisters. The night was full of tales that were sometimes meant to draw the audience in and sometimes meant to make them want to run as far away as possible. This was evidenced by the laughter and screams that emanated from both actors and audience members alike. The Haunting of Hannon continues to outdo itself every year due to the hard work and collaboration between the library staff and the theater department. LMU delights in the opportunity to showcase all the wonderful talent they have in its faculty and in their students that allows this event to flourish. The library is happy that they can continue to entertain the community through this event and is grateful for all the support of the people that made this night happen. Thank you, Darwin, for sharing your experience and reflections with us! If you are a student interested in being an event correspondent at a library event, contact John Jackson, Head of Outreach and Communications for the William H. Hannon Library.